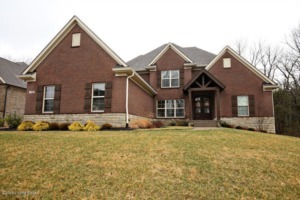 STUNNING 5 Bedroom, 4 1/2 Bath Custom Crafted Home! Built in 2014 by Mastercraft Homes with attention to detail and exquisite quality throughout. Gorgeous curb appeal is delivered by the brick/stone combination and beautiful timber accented front entry porch framing. Enter through the custom arched double door entryway and soaring two story ceilings at the foyer and great room beyond will greet you. The great room, kitchen and dining space flow beautifully for entertaining and just wait until you see the fabulous lower level! From the spacious 3 car garage entry you'll appreciate the large mudroom, laundry and powder bath! A convenient first floor office and a deluxe owner's suite completes the first floor with a gorgeous en suite bath and large walk-in closet. The stairs to the second level feature gorgeous custom newel posts and wrought iron balusters. The second floor includes three spacious bedrooms, 2 full bathrooms (one a jack-and-jill privately serving 2 rooms) and you will note there is no shortage of closet space or natural light throughout the home! Moving down to the custom lower walk-out level, prepare to be impressed. The exquisite attention to detail continues with custom mill work, raised ceiling heights, a beautiful kitchen serving a large family room/game room space, patio access, a large 5th bedroom/home gym, a 4th full bathroom and the list goes on! Be sure to view the custom special features document attached for a full list of specific upgrades and selections for the home. Central Vac throughout, wired security, irrigation, spacious drive and 3 car side entry garage, premium flooring throughout including rich hand-scraped plank flooring on the main level, sleek baseboard receptacles on the main level, custom Amish-Built cabinetry and built-ins, gas fireplace and dedicated gas grill line on the rear deck, custom gourmet kitchen with top of the line GE stainless steel appliances, including a 5 burner gas cook top, traditional convection wall oven and Advantium speed cook oven. No detail was overlooked! Click to schedule your showing.